It’s crunch time – You have a job interview, so you are in the race! After weeks of sending CVs, following up, getting turned down, following up, speaking to people, leaving messages, following up, you finally have a date and time confirmed. The finish line is within sight and there, just on the other side, is the prize: That job you are after. 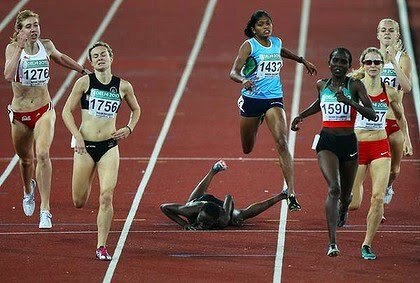 But have you ever watched a race, and see someone crash out just before they reach the finish line? What a disappointment! Sadly, many interviewees fail at interview – Not because they don’t have the right skills or weak CVs, but because they don’t shine in the interview. A good CV can get you through the door, but if you don’t follow through in the interview you will fail. Like that runner in the race, who trained and worked hard to get there in the first place, the job isn’t done until after you cross the finish line. Fortunately, there are a few things you can do to help yourself along and I will explore these in the next few blog posts. 1. Don’t get over excited! Relax, think clearly and take some time to make sure exactly why you want this job, and why it’s worth fighting for. Desperation means going in half cocked. Instead, prepare thoroughly and make sure you are relaxed on the day, so that you can perform to your own best advantage. Nerves can be controlled. If you manage to keep yourself calm you are setting yourself up for a fabulous interview. Obvious? And critical. Making a great first impression and establishing a real connection is everything. Smile, make eye contact, be enthusiastic, sit forward in your chair, use the interviewer’s name…. Be yourself, but be the best version of yourself you possibly can. We all want to work with people we like and who like us. Use that basic fact to your advantage. Coming across as arrogant, conceited, difficult, or simply self-absorbed are likely to trip you up very quickly. Ask questions about what really matters to you. Focus on making sure the job is a good fit: Who you will work with, who you will report to, the scope of responsibilities, etc. Interviews should always be two-way, and interviewers respond positively to people as eager as they are to find the right fit. Plus there’s really no other way to know you want the job. And don’t be afraid to ask several questions. As long as you don’t take completely take over, the interviewer will enjoy and remember a nice change of pace. It’s a good idea to take a writing pad and pen, with pre-prepared questions but jot down new ones as you go along, and take notes for future reference. A sad truth of interviewing is that later, the interviewer may not remember a tremendous amount about you — Especially if they’ve interviewed a number of candidates for the same job. Later you might be referred to as, “The guy with the shiny shoes,” or, “The woman with the funny accent,” or, “The chap who grew up in Wales.” These identifiers are known as hooks, and you can use them to your advantage. Hooks could be clothing (within reason), or outside interests, or unusual facts about your upbringing or career. Hooks make you memorable and create an anchor for interviewers to remember you by — and being memorable is everything. The best hooks are work related – For obvious reasons. If you can set something that will make you memorable and remind them of a particular skill, you will have gained a real advantage. An unusual or even humourous story that reflects on your strength areas, or a specific succesful outcome or achievement, will bring light relief to the interviewer and make you memorable for all the right reasons. « 2012 in review – Thanks for reading my blog!